Reference number for this case: 8-nov-54-Voussac. Thank you for including this reference number in any correspondence with me regarding this case. Ufologist Jacques Vallée indicated in the 1960s that on November 8, 1954, in Voussac, near Doulouvre, "it is said that trustworthy people" saw a luminous sphere land on the edge of a forest, and become dark. The next morning, "research proves" that an area of ? ?4 to 5 meters in diameter had no more leaves while the soil was otherwise covered with leaves. Jacques Vallée said that the earth appeared to have been dug and that "no noise had been heard". Vallée indicated no source and so far no primary source has been found. In May 1972, Jean Giraud and others investigators tried to find one of the "numerous witnesses", and found none. There was just the Voussac town hall female secretary, who remembered that "about that period", an old woman who had since died and was coming back to get milk at night had observed the departure of the sphere in question (or some sphere) that would have made a pause just above the trees. Nov. 08, 1954, 06:00 P.M., Voussac (France). Jacques Vallée indicates that on November 8, 1954, in Voussac, close to Doulouvre, "it is claimed that people worthy of faith" saw a luminous sphere landing at the edge of a forest, and becoming dark. The next morning, "research proved" that a surface from 4 to 5 meters in diameter did not have any more leaves on the ground while the rest of the ground was covered with leaves. Jacques Vallée specifies that the ground seemed to have been dug and that no noise had been heard. No source is indicated. The case "332 11/8/54 Voussac" is noted as to be investigated or re-investigated. Many people witnessed the landing of a luminous sphere at the edge of the Vacheresse forest. Once on the ground the craft went out. The next day on the spot, the witnesses found that the earth had been turned over, while everywhere else the ground was littered with dead leaves, at this place, the earth was bare on a circle of 4 to 5 m of diameter. (Personal investigation). 8 novembre (cas 332 du catalogue J. Vallée et enquête Giraud) Voussac 18:00. De nombreuses personnes assistèrent à l'atterrissage d'une sphère lumineuse en bordure de la forêt de Vacheresse, qui s'éteignit au sol. Le lendemain, sur les lieux, les témoins constatèrent que la terre avait été comme retournée, alors que partout ailleurs le sol était jonché de feuilles mortes. La terre était nue sur un cercle de 4 à 5 m de diamètre. The authors indicate that on November 8, 1954, at 06:00 P.M. in Voussac in the Allier, close to the hamlet of Doulouvre, the inhabitants of Voussac walk in the forest of Vacheresse. Whereas they approach the edge of the wood, they see a luminous sphere go down from the clouds and land at the edge of the meadows. Then it loses its luminosity and becomes dark. The walkers do not dare to approach and make a detour. They announce the fact to the gendarmerie. The morning of the following day, the survey carried out on the spot resulted in the discovery that inside a zone of 4 to 5 m in diameter, there were no dead leaves, whereas the ground was strewn with it everywhere else. The ground seemed to be turned over. Once on the ground, the craft went out. The next day, on the place, the earth seemed to have been turned over. While everywhere else the soil was littered with dead leaves at this place the earth was bare on a circle of 4 to 5 m in diameter. The investigation conducted in May 1972 did not find one of these numerous witnesses. However, the town hall [female] secretary, questioned, remembered that "around this time", an old woman who had since died and who had just returned from fetching milk at the nightfall had observed the departure of the sphere in question (?) which would have marked a pause just above the trees. The two ufologists and authors indicate that on November 8, 1954 at 06:00 p.m., in the edge of the forest of Vacheresse close to the hamlet of Doulouvre, close to Voussac, walkers from Voussac saw a luminous sphere go down from the clouds and land on the edge of the meadows. It then became dark, and the witnesses did not dare to approach, made a turning and continued their walk. They reported the event to the gendarmerie only once returned on their premises. The gendarmerie investigated and discovered an area of 4 to 5 meters in diameter deprived of dead leaves whereas the ground was strewn with it in the neighborhood, and the ground seemed to have been dug. The two authors quote as source Jacques Vallée's catalogue, the book by Garreau and Lavier, and the Allier catalogue in "Special OVNI-Info" by Group 03100. When reliable people told authorities a luminous sphere came down to a landing in Vacheresse forest on the 8th, it was decided by the same authorities to check out the story the following day. No one saw the object depart but witnesses said the big ball "went dark" after landing. Searching the area the next afternoon, investigators found the ground carpeted with leaves, a normal condition, but there was an area of about dozen feet across that was strangely clear of any tree debris. The soil was disturbed in the cleared area. No mention was made of the shape of the supposed trace area. VOUSSAC,FR:LUMn.SPHERE LANDS BY VACHERESSE WOODS:DARKENS:DIRT FOUND DUG UP. 1954 - In the Vacheresse Forest in Voussac, France a number of reliable persons reported seeing a luminous sphere land at the edge of the forest and then become dark. The next morning, an investigation disclosed that an area 4 or 5 meters in diameter had no leaves, while the ground elsewhere was covered with them. The earth seemed to have been dug up. (Source: Jacques Vallee, Passport to Magonia: A Century of Landings, p. 243). Jérôme Beau indicates that on Monday, November 8, 1954, to 18:00 in Voussac in France, forest of Vacheresse, people worthy of faith see a luminous sphere landing at the edge of the forest and becoming dark then. The next morning, an investigation discovers that inside a zone from 4 to 5 m in diameter there was no leaves whereas the ground is strewn with it everywhere else. The ground seems to be turned over. Luc Chastan indicates that in the Allier in Voussac on November 8, 1954 at 18:00 hours, whereas several people walked at the the edge of the forest of Vacheresse, they saw descending from the clouds a luminous sphere that landed at the edge of the meadows. It then became dark. The careful witnesses did not approach and preferred to turn away. They alerted the gendarmerie when they were back. The gendarmes discovered an area from 4 to 5 meters in diameter where all the dead leaved had been puffed away whereas around, they had not moved. The source is indicated as "Ovni, Premier dossier complet... par Figuet M./ Ruchon J.L. ** éd. Alain Lefeuvre 1979." A case file on this website indicates that on 8 November 1954 at 18:00 in Voussac, France, a luminous sphere landed at the edge of a forest and became dark. In the Vacheresse Forest, reliable persons reported seeing a luminous sphere land at the edge of the forest and become dark. The next morning, investigation disclosed that an area four or five meters in diameter had no leaves, while the ground elsewhere was covered with them. The earth seemed to have been dug up. One saucer, about 20 feet across, was observed by more than two witnesses in a forest. The sources are indicated as Bowen, Charles, The Humanoids: FSR Special Edition No. 1, FSR, London, 1966; Vallee, Jacques, A Century of Landings (N = 923), (in JVallee04), Chicago, 1969; Schoenherr, Luis, Computerized Catalog (N = 3173); Phillips, Ted R., Ted Phillips investigation files; Phillips, Ted R., Physical Traces Associated with UFO Sightings, CUFOS, Chicago, 1975; Hatch, Larry, *U* computer database, Author, Redwood City, 2002. *Nov. 8, 1954 - At 6:00 p.m. a number of people in the Vacheresse Forest in Voussac, France reported seeing a luminous sphere land at the edge of the forest and then become dark. The next morning, an investigation disclosed that an area 4 or 5 meters in diameter had no leaves, while the ground elsewhere was covered with them. The earth seemed to have been dug up. (Sources: Harold Wilkins, Flying Saucers Uncensored, p. 238; Jacques Vallee, Passport to Magonia: A Century of Landings, p. 243, case 332). In the Vacheresse Forest, reliable persons reported seeing a luminous sphere land at the edge of the forest and become dark. The next morning, investigation disclosed that an area 4 or 5 m in diameter had no leaves, while the ground elsewhere was covered with them. The earth seemed to have been dug up. Reliability is not here... The "traces" "prove" absolutely nothing because they could be anything, unrelated to the "luminous sphere". Nothing even allows to claim this was a "landing", because often witnesses seeing a meteor pass behind the horizon, or behind lansdscape features, interpret this as a "landing". [jv2] "The Pattern Behind UFO Landings", chapter by Jacques Vallée, in "The Humanoids", book by Charles Bowen, Neville Spearman publisher, U-K., 1967. [jv1] ""Passport to Magonia - On Ufos, Folklore, and Parallel Worlds", book by Jacques Vallée, Contemporary Books publisher, USA, page 243, 1969. [ld2] Ufology magazine Lumières Dans La Nuit, (LDLN), France, #118 page 4, June 1972. [jv1] "Chronique des Apparitions Extra-terrestres", French translation of "Passport to Magonia", book by Jacques Vallée, Denoel publisher, France, page 298, 1972. [jv2] "Le Modèle Derrière les Atterrissages d'OVNIS", chapter by Jacques Vallée, in "En Quête des Humanoïdes", book by Charles Bowen, French translation of "The Humanoids", J'ai Lu publisher, France, page 66, 1974. [gl1] "Face aux Extra-Terrestres", book by Charles Garreau and Raymond Lavier, Delarge publisher, J'ai Lu, France, page 68, 1975. [io1] Report in the ufology magazine INFO-OVNI, France, special issue "Les Atterrissages en Auvergne", page 10, not dated. [pr1] "INTCAT Part 10", catalogue compiled by Peter Rogerson, in the ufology magazine MUFOB, U-K., New Series #5, MUFOB page 8, Winter 1976-1977. [fr1] "OVNI, Premier Dossier Complet des Rencontres Rapprochées en France", book by Michel Figuet and Jean Louis Ruchon, Alain Lefeuvre publisher, France, page 211, 1979. [lg1] "The Fifth Horseman of the Apocalypse - UFOs: A History - 1954 November - December", monography by Loren Gross, USA, page 19, 1991. [---] "Computerized Catalog", compiled by Schoenherr, Luis. [---] "Ufologue Jacques Bonabot, Belgique. 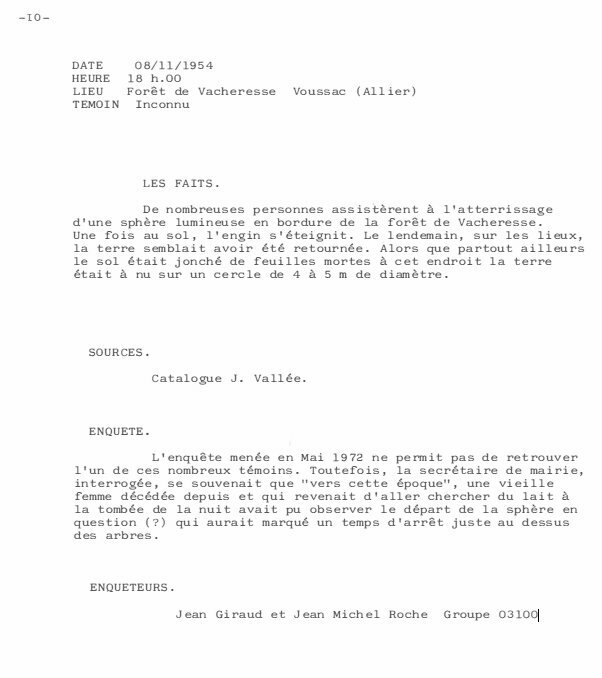 [mf1] "Catalogue Francat des rencontres rapprochées en France (Listing 800 1982) (2 · Suite)", list compiled by Michel Figuet, in the ufology magazine Lumières Dans La Nuit, (LDLN), France, #257-258, page 21, November - December 1985. [dj1] "Encounters With Aliens On This Day", compiled by Donald A. Johnson, USA, circa 2005, at www.ufoinfo.com/onthisday/November08.html. 1.0 Patrick Gross December 23, 2008 Conversion from HTML to XHTML Strict. First formal version. Additions [dj1], [jb1], [lc1], [ud1]. 1.2 Patrick Gross November 22, 2016 Additions [lg1], [ta1], [ub1]. 1.3 Patrick Gross November 30, 2016 Additions [ou1], [io1], [pr1], [ld1], [ld2], [mf1], [pr2]. 1.4 Patrick Gross December 8, 2018 Addition of the Summary. Explanations changed, were "Not looked for yet." This page was last updated on December 8, 2018.